OpenCelliD releases a new version of the contribution app. This is intended to make the contribution process smoother than ever. OpenCelliD also brings back open sandbox, Geography based CSV dumps and cell stats. OpenCelliD.org has a new look! We've built a dashboard that makes integration easier than ever. The new dashboard also comes with a reporting section that gives an overview of number of API calls made and success rates. Markus Semm, the man who built and brought OpenCelliD to where it is today, transferred OpenCelliD maintainership responsibilities to Unwired Labs. Unwired Labs is an enterprise geolocation firm that specialises in Cell-tower & WiFi based positioning. As a part of Unwired Labs, we aim to further improve OCIDs datasets, modernize infrastructure and push forward with WiFi & IoTWAN datasets. Unwired is a geolocation organization which aligns its strengths with the OpenCelliD community. Mozilla Location Service (MLS) and OpenCellID agreed back in 2014 to share their data. MLS at that time was able to implement a regular import of OpenCellID cell locations in short time whereas OpenCellID at that time was busy with rewriting the entire code for the OpenCellID server software including a serious clean-up of the existing cell locations data (see below). Early 2016 the OpenCellID developers finally started implementing an automatic regular import of the MLS cell location data. The initial import has been completed and from now on new data arriving on MLS servers is replicated once per hour to the OpenCellID database.. Since MLS currently has approx. 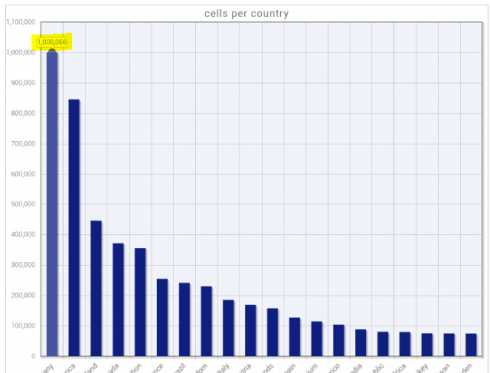 19 Million unique GSM/CDMA cells in its database which OpenCellID does not have - this merge of data is a great benefit for all users of the OpenCellID database. Thanks to the MLS CC-0 license we can merge the MLS data into the OpenCellID database which makes it seamless for all OpenCellID users to access the database: no changes of any code are required. Since the MLS team has decided not to publish the measurements which were used for calculating their cell tower locations you will not see any increase of the OpenCellID measurements database whereas a significant growth of the cell locations database is reflected in all related OpenCellID statistics. We are very happy that this collaboration of two Open Source communities works so smooth and cooperative for the benefit of all being interested in having access to free cell location information. We would like to use this opportunity saying a warm "THANK YOU" to Hanno and the entire MLS team. There are a few (less than 10) APIkeys which are heavily misusing the OpenCellID API in one or the other way. Last week this raised to a total of 100-160 requests every second, so more than 10 million unauthorized requests per day, and caused a noticeable drop of the performance of the OpenCellID servers. On top of that we constantly receive ten thousands of requests every day without any APIkey or with a fake APIkey. Therefore it was decided that these APIkeys and requests are blocked in our load balancers and will not get ANY feedback from the platform any more. The long awaited data clean-up has been completed! After taking the responsibility for OpenCellID we first have rewritten the entire software because former Ruby on Rails implementation was poor and could not handle the expected amount of users and data. This was completed in summer 2014. Then we approached all issues regarding the improvement of the quality of the data. As a first step we implemented a variety of filters to ensure filtering out all bad data from newly arriving measurements. This was completed early 2015. Then we started to clean up all existing data. In order to do so we have applied a number of filters to all 1.5 Billion records in the database and removed all records which are obviously wrong (e.g. a cell with German MCC located in Africa). Due to the complex computations execution of this filtering took several weeks despite the fact that we are using several powerful servers with 128GB RAM, 16 processors etc. After completing this batch filtering process the first time back in June we found, that we missed to execute one intermediate step in the middle of the process so we had to start over again. 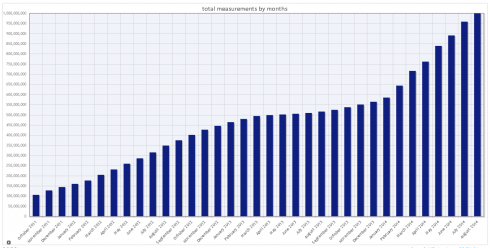 Our 2nd attempt worked as expected so now we have a clean and trustworthy database with measurements. Then we recreated all computations of the positions of all cell IDs. This has been completed today. This means for you that in case you are working with the OpenCellID measurements_? ?.csv.gz files you should download ALL existing files again in order to work with the latest cell tower position tables. Those of you using the OpenCellID API already enjoy the updated data. Nothing to be done in this regards. Enhanced geo-location filtering by improving the country boundaries database using OpenStreetMap data. This filter checks if the GPS position of a measurement is inside the country defined by MCC or near by. An additional mechanism has been implemented that limits the API read requests to 1000 read operations per day for all users without a special agreement with OpenCellID. The range (radius) of each cell has been added to the cell export CSV file as well as to the affected API requests. Currently the data provided for most of the cells is not valid. This column will be filled with accurate data after the database clean-up which is planned later this year. Duplicate measurements are filtered out. If two consecutive measurements for the same cell have the same coordinates, then second measurement will be filtered out. Newly incoming measurements are assumed to be suspect if they are more than 150km away from current average cell position of the related cell. Before the DB clean-up, the filter will be enabled only for precise cells, because calculated cells might currently have wrong coordinates. After the DB clean-up, we will apply the filter for all cells. MCC of incoming data is verified now according to geographical location: in case the MCC of a measurement does not match with the country the measurements GPS coordinate is pointing to, then the measurement is treated to be suspect. For now a square around each country is used with a distance to the country border of 40 km to 100 km depending on the latitude. It is planned to improve this validation in 2015 by using accurate country border data. OpenCellID last night exceeded the number of 1.000.000.000 (1 Billion) measurements thanks to its great community of contributors! Version 3.3.9.1 has been launched. Important German "Linux Magazin" publishes OpenCellID article. Italian language added to UI - thank you Lorenzo for the translation! allows users to create a link with a given zoom level and area which makes it easy to return to this area later; this can, for instance, be used to supervise a select area. Information about white listing can be found here. OpenCellID test environment http://test-ocid.enaikoon.de/ is now public. The software on this MongoDB cluster is frequently updated, typically showing the latest achieved status. The version number does NOT change with each update. Warning: this is NOT a stable release and may be down or contain corrupted data at any time. It is also slower than the production system due to artificially limited hardware resources that makes it easier to find inefficient code. Version 3.3.5.2 was launched; this is the fastest OpenCellID version to date. This page was last modified on 25 April 2018, at 21:58. This page has been accessed 92,612 times.